﻿ About us | autoclave|water shower autoclave|steam autoclave|pulse vacuum autoclave|Zhangjiagang Huanyu Pharmaceutical Equipment Co., Ltd.
Zhangjiagang Huanyu Pharmaceutical Equipment Co.,Ltd established in 2001 and joined by a group of domestic young and dynamic engineers who are sophisticated designer and maker in sterilization field. After years of hard work, we are becoming one of the leading enterprises. Designs and manufactures rank high position in technology and market. Zhangjiagang City is located in the south bank of the Yangtze River, belonging to a strong culture, economy is highly developed historical and cultural city of Suzhou, China county economic strength ranks top hundred counties. Close to Shanghai, Nanjing, Suzhou, Wuxi, Shenyang-Haikou Chang Tai Highway, G2 Beijing-Shanghai Expressway and being built Shanghai to Nantong railway, they shorten the distance from Zhangjiagang across the country.Our products include autoclave,sterilizer,medical autoclave,water shower sterilizer,pulse vacuum autoclave and steam sterilizer. 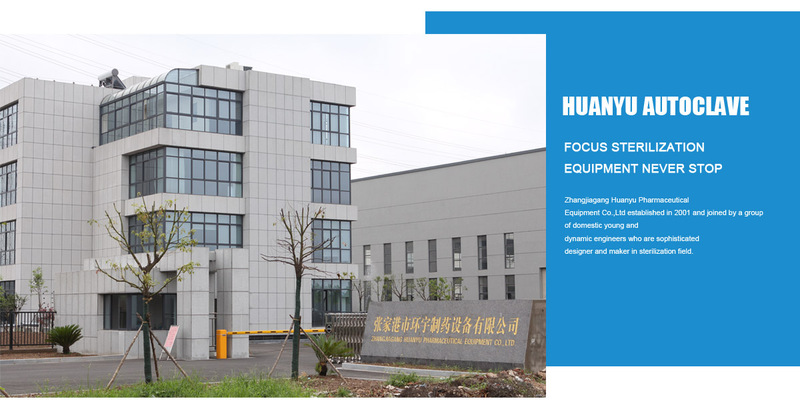 The company has D1, D2 pressure vessel manufacturing license, medical device manufacturers license, passed the ISO9001 quality management system certification, the production of a variety of disinfection and sterilization equipment covers the pharmaceutical, medical, biotechnology and food industries, in line with national GMP certification and special equipment safety supervision, health and epidemic prevention departments of the relevant requirements. The main products are bath-style, rapid cooling, ampoule (oral) Sterilization leak, pure steam, medicinal and other components of the pulsating vacuum over a hundred kinds of specifications for infusion (including automatic logistics line), water injection, oral solution, canned food, biological products, media, Chinese patent medicines, spices, medical equipment, 100 clean areas such as sterile products such as clothing and experimental equipment and appliances, the sterilization operation. Product configuration design using modular approach can be developed and produced according to user needs all kinds of special specification products to meet the diverse needs of the market. And provide product selection, installation, GMP certification and staff training. Universal to all my colleagues in the company of “integrity, dedication, truth-seeking, aggressive” business philosophy, dedicated to providing quality service and high quality products, together to work for a better future!